I have been meaning to post this for a while. When I took my bird home she was clipped, but I let them grow in with the first molt. I knew that if I made the wrong decision and had to clip her she would be really sad. But if I never let the wings grow in the first place, she would never know what she was capable of (and thus not know what she was missing). So I wanted to make the best decision I could with her first molt. What to do? What to do? At the time I was really torn about it. Would I be able to keep her safe flying around the house? Would I be able to save my house from HER? Well..... while I fretted about the decision her wings grew in bit by bit and the decision pretty much made itself. Because she grew her feathers one at a time, her flight skills grew gradually so it was easy for me to adjust to her as she became more adventuresome. And it was never too much for me to handle. In fact, she became WAAAYYY easier. At the time, my main worry was that I would not be able to keep up. She was so high maintenance. But what actually happened was comical and ironic. Poop? Not a problem... she can fly to the perch when she needs to. Biting? Not a problem... she can fly away when she needs to. Boredom? Not a problem... she can fly around and find something to do. Velcro bird? Not a problem... she can fly to follow me whenever i move around the apartment. She does what she wants. She is a completely different bird, and watching her personality change so quickly along with her flight skills, I have no doubt all the positive changes are as a result of choosing to let her grow her wings. As it turns out, there is really only one small problem that hasn't solved itself. Chewing on doorframes. She absolutely loves to do that. It has gotten to the point where I have to take active measures to discourage her, getting up frequently, and sometimes even put her in her cage. She was fine for the last two hours. Now five "chewing" incidents so far while writing this post on three separate doorframes. She learned that chewing gets her immediate attention, potentially making it worse, so i have to be careful creative about how I address it. Since I rent, I don't want to be slapped with a huge bill when I leave so I can't let her do it. The last two days she has been obsessed with the cabinets over the stove in the kitchen. I left it open two days ago and she climbed in to discover a wonderful little cubby perfect for a conure such as herself at this time of year. She does a very cute rendition of what i call the "Springtime Dance" and then tries to get in to nest with my dry goods. But she isn't strong enough to open the doors herself so she just chews and chews and chews to try and open it. I have no idea if this will work... but I tried putting her sworn enemy Mr. Elephant there with some baby dinosaurs, to give her the impression that the nest was already taken. People who keep their birds wings clipped have no idea what their real personality is. As their feathers grow in their personalities blossom. That is a great way of putting it. 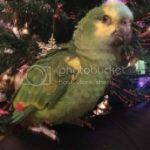 I noticed that this did not get very many replies, but I guess that might be a good thing as I believe that most of the people here share many of your views about keeping their parrots and other birds flighted. I know that all of my birds can and do fly and that I would not want it any other way. I really wish I could get more of the members of the forum to speak up even if it is just to agree with each other. I think that it would help to promote a sense of community and support for each other if we all tried to do this more. Mango is now moulting I hope he grows at least a few flight feathers back to allow him to fly a bit better.Having flighted birds is great my birds all live cage less but still have a large cage in the room filled with toys and also a ceiling with a hanging swing and a perch and toy and I will be adding lots more to keep them busy.Loki my female Cockatiels is very mischievous she has a new plan everyday of what she is gonna do but today she was either being very good or did something I don't know about lol. I agree with this, when I first met Shrek she was very very clingy and could not fly at all, she was also much more agressive and bit her way out of something she didnt like, a few months later when I took her home, she started molting (and still is) and getting those feathers out as she learns to fly. It is so amazing to see that she is now learning to have freedom and be with people other than me, and her bad bites are slowly reducing. She has definitely changed in character and it is for the better. Tillys wings were clipped by us when she was a baby right before she learnt to fly, she would try to fly and just fall because we had clipped her feathers when she was just about to learn how to fly. And I regret us doing that to her. Myrtles personality changed even while growing back her feathers. Though I could not touch her she would jump off her cage to try them. Once on the floor she would walk to me and climb to my shoulder so I could walk her back to the top of her cage. I did not touch her and she had to do all the climbing herself. This is when she began trusting me to serve her instead of posses her. The chewing is a real problem even with Rambo who does not fly. I have created places and supplied parrot safe wood in those places. It slows them down on chewing where I don't want them to but does not stop them. Yes my house has "gone to the birds" and even looks strange to me so I know anyone coming in thinks I am crazy. @Wolf: thanks for the comments. this makes me feel better about not listening to advice to clip from others regarding my current sitution (see my new post "Uh-Oh! The new guy isn't flighted!" ). Since you have multiple flighted birds, and since I know some of all of those came to you as adults, I welcome your thoughts on what to do with Lily and Paulie. @Liz: My house is on its way "to the birds..." too! She has her favorite spots to chew and I can't dissuade her from them. Unfortunately I am a renter, so I have a bit of work to do when i move out of here. patti wrote: I have been meaning to post this for a while. When I took my bird home she was clipped, but I let them grow in with the first molt. I knew that if I made the wrong decision and had to clip her she would be really sad. But if I never let the wings grow in the first place, she would never know what she was capable of (and thus not know what she was missing). So I wanted to make the best decision I could with her first molt. One thing I havefound to protect door frame tops from being chewed is to put a strip of wood above the door frame just a bit thicker than the frame with some doube side glue pads. They then chew the strip of wood instead of the frame and its easily replaced. I have given up on wooden picture frames though, they have all been replaced by metal framed ones.